Report author wants to create a list report in, which, any of the columns can be shown/hidden after the report execution is complete. A report is used by many users. This report has many columns, and depending on which user is viewing the report, users might want to temporarily hide one or more columns and later unhide them. This requirement is different from the case where users know before executing the report, which columns need to be displayed. If the users know beforehand, Render Variable can be used to hide the columns. But in this case, the columns cannot be shown again without re-running the report. I have tried this with a list report, but the script should work for crosstabs as well. If you have trouble making this work in crosstabs, please post in the comments section. Implementing this requirement needs some placeholder HTML items on the page in addition to the main script. The list report in cognos is rendered as a table in the cognos viewer, consisting of rows and columns. Unfortunately, the entire page in Cognos viewer consists of rows and columns. Now we need a bunch of links outside the list report that can be used to toggle (show/hide) the columns. 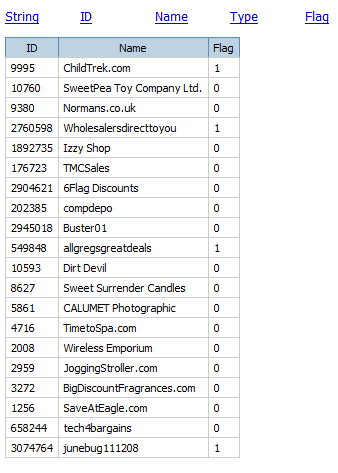 You can create this just before the list report, but it won't work if your report spans multiple pages. I placed this in the page header, since the header spans across all the pages. I created a table with one row and 5 columns one for each column in my list report. I then placed, one HTML item in each column. The HTML items will have the following scripts. You can see that even though the column is hidden, the link "String" is still visible. You can click on this link again to show the "String" column. Even though the approach may seem long, it is pretty simple. The advantage of this script is that, since we are not manipulating any cognos objects like prompts, this script should work for most versions of Cognos. The script has been tested in both Internet Explorer and Firefox. Thanks,Sriram.It is truely wonderful.Coudn't we do away with java script.Appreciate your time and effort. Could you please add a report XML to it. Could you please add a report xml for this? I tried it seems like I get an object error at char 3. I do have a question on your script. What is the item market that you are referring to? i want to hide the list at the runtime. after pressing the button the my list will display, please give me the response. The posts from you are real good. I got a requirement, could you please suggest any solution how to implement that. I got a hierarchy (eg., Products) and a Measure. 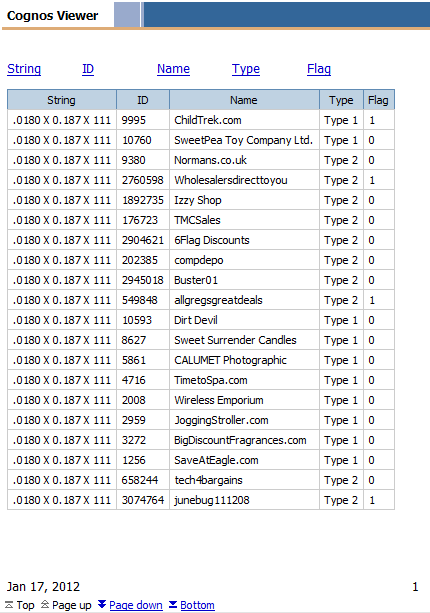 Now when I drill down to detail I need values of a new measure to be displayed. So when I drill down to other level from root level, my measure should display other value. I am facing one issue in my cognos report. 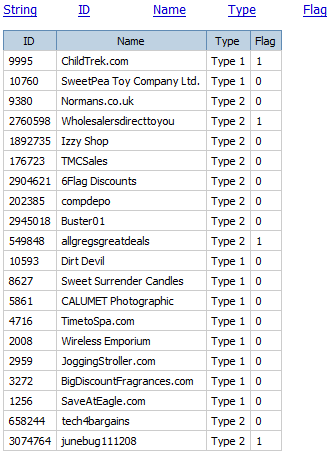 I have list data template and I have data field in my list header along with some labels. The data in the list header is not updated and take the same as previous page list header if there are multiple list objects on the same table. Does this feature work for when I have to hide two or three group by columns. For example if string and id are two columns having a group by then if i hide string , will the grouping be on both the columns or only the ones which are displayed...well i am not good in js...hence asking this. This script should work on grouped columns as well. It really doesn't matter, since we are just manipulating html items. If in case you have trouble making this work, you have to break any merged cells in the grouped column. Superb script, works very well and thank you! However is there a way to amend the script to the list is hidden runtime? Once I press the button the my list will display? Would really appreciate a response? I have a requirement to show/hide multiple measures in a cognos crosstab. I have one dimension, a column as a row and 4 measures. The show/hide for the measures based on prompt multi-select. I am having a hard time formatting the top label. I was trying to show/hide a crosstab column (node cordinate e6) at crosstab. I followed your instruction and successfully did at list but Some how it donesnot work at cross tab.It just hide some values but didnot hide header and other value. I have never tried to use this for crosstab. I will look into it. I was trying to show/hide a crosstab column (node cordinate e6) at crosstab. I followed your instruction and successfully did at list but Some how it donesnot work at cross tab.It just hide some values but did not hide header and other value. I want to create a button for each row. When clicked on respective button it should show the respective row data...Suppose if clicked on the "button"
which is in dept 20 row, it should show the dept20 data only..like this. How to do if i want to hide per one click Columns 1,2,3,4 from a table with 8 columns?